Algorithm to find the first common ancestor of two nodes in a binary tree. Q. Design an algorithm and write code to find the first common ancestor of two nodes in a binary tree. Avoid storing additional nodes in a data structure. NOTE: This is not necessarily a BST. Start with any of the two nodes (lets say p). Travel up look at all the nodes in the other branch of the node if there is any. If you find the second node q, then the current node whose left or right child was being searched is the common ancestor. 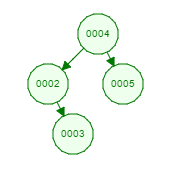 If, however, you don't find the other node, start with the second node q and repeat the same procedure. If you find p travelling up (since if p did not find q on it's way up, it must be beneath it), then p's parent is the common ancestor (or p if you define a common ancestor that way). If p isn't found, and q reaches the tree's root, p isn't there in the tree. Whether a node is in the tree or not can be tested by travelling up until you find the root node matching with the root node of the tree you have. Check if left or right of root has p/q. If p is found and q isn't return p and the opposite for the other case. If p is found in left and q in right or the opposite case, then current node is the common ancestor. If p and q are found on the same side, repeat the procedure for that the current node's child which is there at that side (left or right). Constructing a minimum height BST with elements from a sorted array. Q. Given a sorted (increasing order) array with unique integer elements, write an algorithm to create a binary search tree with minimal height. 1. Pass the array reference, starting index (s) and end index (e) recursively. 3. Construct a new Node with array[mid] as the value. Q. Implement a function to check if a binary tree is balanced. For the purposes of this question, a balanced tree is defined to be a tree such that the heights of the two sub trees of any node never differ by more than one. 1. Go to the left in tree. 2. If a null is encountered, return 0. 3. Returned value is incremented (this is representing the height at that level). 4. Recursively go to the right in sub trees. 5. Return height from right sub tree. 6. If difference between heights is between [-1 to 1] then return the max of heights of left and right else return -1(unacceptable height) and stop further evaluation. (Since if a sub tree is unbalanced, so it the whole tree). Q. Implement a MyQueue class which implements a queue using two stacks. 1. There are two stacks stack1, stack2. 2. Suppose we are adding elements 1,3,4,5,2. 3. For adding them to the queue, we push them to stack 1. 4. For finding the min, we pop all of them to stack 2 and then pop form stack 2. 5. As long as there are elements in stack 2, finding min is easy, just pop from stack 2. 6. If stack 2 is empty and we need to find min, pop again all elements from stack 1 to stack 2 and pop from stack 2.